Construction for this project should run another seven weeks. So far we have been very happy with our new contractor Jason. We have had some bad experiences with contractors over the last six months… cost us alot of time and money…. There are alot of guys out there right now who are very hungry for work and they will tell you they can do anything, than you give them a project and you soon find out they are in way over there head. Just make sure you are screening them well. I think we bought another house yesterday… we still have to execute contracts but we came to a verbal agreement. I’ll post more details about this one in another post. Today was a busy day for us. I started off the morning by going over to our rehab on Hartford Terrace. Our contractor is just finishing up and he was looking for a final punch list. The Hartford Terrace house is a large 4 bed 1.5 bath colonial that is just over 2,200 square feet. 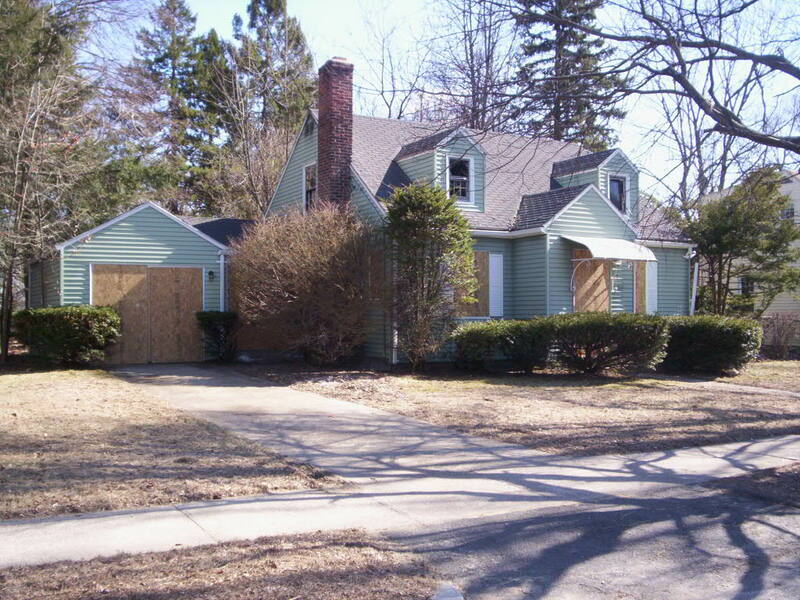 We picked this house up via a short sale. Here are some of the photos I took today. Here is the view looking into the kitchen from the dining room. We opened this wall up and added the breakfast bar. This is the main living room. It is very large and open. This house has alot of great wood work. This is the full bath located on the second floor. This was a complete gut. We added new tub, tile, vanity, lighting and shower panel. Here is a close up of the Shower Panel. It is a big hit with buyers (especially the women). It is european stlyle complete with rain shower head and body sprays. It looks very “space age”. The hardwood floors will be refinished at this house on Friday, then it is ready to be cleaned, staged and put on the market!! I will post some before and after photos when I get a chance. We are still waiting to close on the Fire Damage Cape. There is a lien on the house that the sellers attorney has yet to clear up. In the mean time we met one of our plumbers over there today to do a walk through and get his numbers. I will be lining up a whole slew of contractors to take through there over the next couple days, a few of which came from my Craigslist search I posted about yesterday. So far I’ve heard back from four of them… two seem very promising. We had lunch at the new Golden Corral that just opened up in Springfield… the food is real good. I ate way too much, it’s 11:00 oclock at night and I’m still stuffed from lunch!!! After lunch it was off to a small REIA Group that meets in Southwick. It was a pretty good turnout and I got a chance to do some good networking. I spent this morning searching for new contractors. One of my mentors says that you should always be looking for and prescreening new contractors just like you do motivated sellers. We have two good crews right now working on a couple jobs… but I don’t want to overload them, and with the prospect of two big fire damage jobs coming up… I want to make sure we have some back ups in place. ” My company is looking to expand our network of professional contractors and I saw your ad on Craigslist. We buy, renovate and resell 1-2 properties per month in the greater Springfield area, and need additional reliable and affordable contractors. Job size varies from light cosmetics to full gut rehabs. Our larger projects will require permitting so you must be licenced and insured. We buy these properties for investment purposes and will not be the end user, therefore affordable pricing and timeliness of job completion are of utmost importance. Also, the ability to work with other tradesmen (plumbers,electricians, HVAC) and orchestrate a job site are key. If this sounds like something you may be interested in please call me or email back as I may have 1-2 projects for you to look at. As I get responses I will further prescreen them and have them come out and bid a job or two. I also ask for references and a portfolio/photos of previous jobs. I have been burnt by a few contractors in the past because I was too lenient in my prescreening process. (Just a side note, If your contractor needs you to provide the work truck and/or tools, they are probably not your right guy). If any of you readers have good tips for finding contractors feel free to share them in the comments section! We should have a closing coming up over the next couple days. It will be a nice rehab.